I love cacti of all shapes and sizes so I was like a kid in a candy shop, of course I wanted to take them all home but I had to restrain myself! We did have an incentive to get to the top of Mount Lemmon, Kathie had told us about a beautiful little pizza and cookie place at the summit, the Mount Lemmon Cookie Cabin - this was my husbands incentive, mine was to see the unusual Yellow-eyed Junco and neither of us were disappointed. The Cookie Cabin was charming and both our pizza and giant cookie were delicious, made all the better by being enjoyed outside in the crisp mountain air next to a log fire. All the time we were eating, the Yellow-eyed Juncos were hopping around our table looking for dropped crumbs! All too soon it was time for us to head back down the mountain but as it was by now late afternoon we had to keep stopping to take photos of the dramatic scenery made even more beautiful by the warm evening light. On the birding front I saw one more new species on one of our stops, a Mexican Jay. There was a flock of six of them and, like all members of this family they were very loud and raucous. As we made our way down the mountain the sun sank below the horizon and the sky lit up with a dazzling kaleidoscope of colours. Last Sunday I did something I could never have imagined before I started blogging. As most of you who read my blog on a regular basis have probably figured out by now, I am a fairly (very) anti-social creature and my idea of a happy existence is to have no contact with humans (with the exception of my mate) and be surrounded by animals! Having said all that I have been following a wonderful blog called Sycamore Canyon for some time now and it's creator, Kathie has totally captured my imagination with her beautiful descriptions and stunning photos of life around the Tuscon area. So with more than a slight feeling of nervousness I arranged to meet up with her on our recent long weekend in Tuscon. I must admit I felt almost as if I was going on a blind date and I almost bottled out of it on more than one occasion but if you read her blog, and I hope you will, Kathie shines through as one of life's truly good people. So with my husband as back up (maybe I got it all wrong and Kathie was an axe murderer!! - sorry Kathie please excuse my zany English sense of humour!) we met up early on Sunday morning in an empty car park in downtown Tuscon. Of course I needn't have been so anxious, Kathie greeted me warmly with a big hug and we hit it off from the moment we met. With a brief stop at a nearby Dunkin Doughnuts (partly to devise our plan for the morning and partly to compensate my husband for 'putting up with' a morning of birding) we headed out to a beautiful area called Agua Caliente. Before I moved to the US I had been living in Zambia and over my years there I had grown to be reasonably good at identifying the endless array of stunning bird species in my area. Of course when I moved to America I had to pretty much start from scratch. Learning birds on your own is quite a tricky process because you have to study the bird, identify what you hope will be distinctive field markings and then try and find it in your field guide. I have done this rather laborious process in numerous places with varying degrees of success but to actually visit an area with someone who knows the local species is so much easier and more enjoyable! I would only ever describe myself as a casual birder these days (it was my area of expertise when I worked as a safari guide) so whatever we found would be a pleasure for me. There were numerous duck species enjoying the water and a solitary Coot. As we moved around the waters edge several of the ducks came to the shore, hoping, I am sure, that we were going to feed them. As we stood chatting and enjoying our surroundings the single Coot also plucked up the courage to come out of the water in front of us. This is a relatively rare treat as the Coot is a fairly shy species. 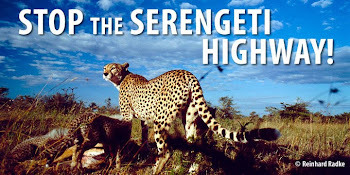 Its bravery gave us the opportunity to see at close range their rather stunning, lobed feet. This is an alternative design to the more common webbed foot seen on numerous aquatic bird species. As the Coot pulls its foot forward through the water, the lobes fold back, so reducing the amount of resistance and then as the Coot pushes its foot back, the lobes spread and form a larger surface area, thus helping to propel the bird through the water. We continued to stroll around this enchanting area with Kathie regularly pointing out different bird species and identifying various calls. As we walked the habitat started to change. We moved away from the tree lined oasis into drier more desert like surroundings and just as we were transitioning between the two we came across our second big treat of the morning. A small tree with six Western Bluebirds perched in it. One of the tricky things about birding in an entirely new area alone is that you don't really have a feel for what is rare and what is common. You tend to relate more to, is this a new species for me or have I seen it somewhere else before. However with Kathie as my guide I could tell by the level of excitement in her voice that we were sharing something special here. If you spend much time around birders (and lord knows they are a strange bunch :) ) You discover that they are generally divided into two types. The first being the type who are driven by their personal species lists and all they want to do is visit as many places as possible and tick off as many species as they can. The second type of birder, also enjoys seeing new species but actually enjoys spending time observing the birds, watching their behaviour and how they interact with their surroundings. Luckily both Kathie and I fit into this second category and so we were more than happy to stand quietly and watch the little flock of bluebirds in the tree for quite a while. My dear husband is endlessly patient with me when I do this, he usually occupies himself by by photographing the surrounding area. As we moved further into the drier habitat the birds became scarcer but it didn't really matter too much. The weather was about as perfect as it could be, I love cacti so was thrilled to see all the different species with their unique forms and we were enjoying Kathie's company so much that any birds were just a bonus! We slowly wound our way round in a loop and then headed back towards our vehicles but Kathie had one more surprise in store. Being a perfect host she had thoughtfully brought a thermos of tea with her! What more could I ask for? Being a true Brit I was never going to turn down the offer of a cup of tea :) We sat under the trees and chatted, learning more about each other and sharing lots of laughs together. Kathie was kind enough to suggest a couple of other areas that we may enjoy visiting during the rest of our day (more of that in my next post) and giving me the heads-up on what bird species I might see there. And so it was with some reluctance that we finally parted ways. I am delighted to say that in spite of my anti-social tendencies I definitely have a new BBFF ( Best BIRDING Friend Forever!!) Thank you Kathie for a delightful Birthday Birding trip. For another version of our morning and a complete bird list, check out Kathie's post. so lounging around in our room wasn't too much of a hardship. The next morning I awoke to find these two Mockingbirds have a face-off outside our room. It was so funny to watch them standing face to face and jumping up and down on the spot. It went on long enough for me to watch them, go back into my room and get my camera and come back out and snap off a couple of pictures! Mules, horses, stagecoaches and wagons and everyone strolling around in period outfits. I felt eight years old all over again! It is so cool to go somewhere that has a history so utterly different from the history I grew up with in England. We strolled along the main street, paid a visit to the Birdcage Theatre and even took a tour of the town in a covered wagon! It was a real step back in time. I also discovered that the big shoot-out at the OK Corral didn't happen in the OK Corral at all but in a little alley way behind the corral! That was why the double-barreled shotgun proved so lethal, you can't really avoid much of the shot when you are in a ten foot wide alley - Ouch!! They are hard to see but on the left hand side of this picture are Leroy and Tyrone, the two huge black Percherons who pulled our covered wagon round town at a wonderfully sedate and stately pace. By this time I was beginning to flag so we made our way back to the car. You can see from the pictures that the weather wasn't being entirely what we had hoped for in the desert and sure enough as we left Tombstone the sky got darker and darker. There were tiny little rain storms blowing around among the mountains and it made for some very dramatic scenery on our drive back to Tuscon. These wide open spaces are definitely having a good effect, I am certainly starting to feel more like my old self. Just to finish my day off on the right note, we stopped of at a traditional belt and holster makers shop and when he discovered I used to ride horses, the owner tried to sell me one of his horses! It is funny how odd random things cheer you up when you are feeling below par - this dying swan is not done yet!! I have posted about our media hungry Box Turtle, Harrison before. He has done various TV pieces over the years and he seems to relish all the attention. His latest project is as our promo-guy for our current exhibit, the National Geographic, Critter Cam. We got a tiny little spy camera which is light enough that it doesn't inhibit him at all and he made a little video piece which I posted recently. Is this turtle a natural celebrity or what!? 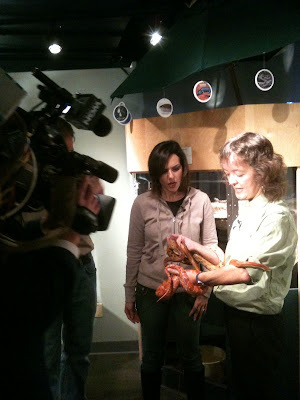 On Wednesday last week one of the local TV stations came to the Museum to help us promote our ten year anniversary celebrations and in particular to talk about an event I came up with last year that we run the night before Halloween, called Supper with the Snakes. It is a really fun event where all the children dress up in their Halloween costumes and come to the Museum, meet all our snakes and take part in all sorts of snake related games and activities. Anyway, the presenter arrived and we were doing a number of different slots with various different animals, with a loose Halloween theme running throughout. We started with the tarantula, which she was terrified of - OK well fair enough, plenty of people don't like large spiders. (The photos are all taken on a cell phone so they are not the greatest.) 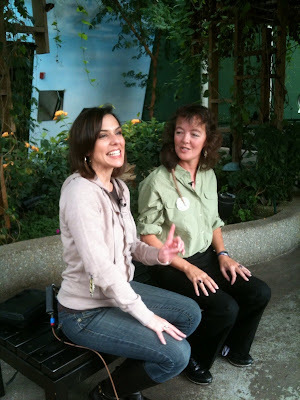 We did a segment with the Madagascan Hissing Cockroaches which she hated. Well that is OK, cockroaches aren't exactly cute and cuddly! 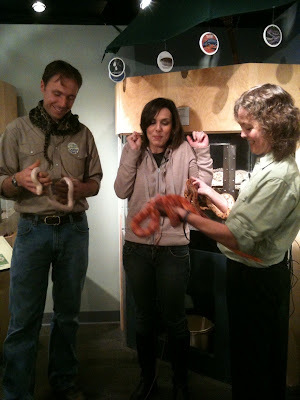 Then we did the snake segment and she was terrified of them too! Now these are about the most mellow of snakes imaginable but I know some people find them a little daunting so fair enough. Here is the link It gives you a pretty good idea of how not into them she really was! Now bear in mind we are trying to promote an event here so some positive images would be good! The final piece I was doing I went for my best ambassador, he's furry and friendly and usually wins everyone around! 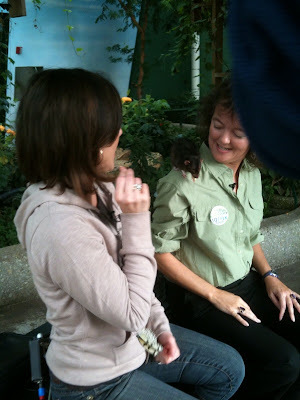 I don't know if you can see him sitting on my shoulder but it is Scabbers our rat. He is a real charmer and behaved impeccably throughout the piece, politely taking a treat from the presenter and sitting on my shoulder delicately nibbling it. And the picture below shows the presenters reaction to him!! Oh well I guess I do work with some slightly less appealing animals although I love them all. In spite of her rather questionable coverage we did get a good reaction to the pieces and the bookings for the event doubled in 24 hours. What is the line about all publicity is good publicity? I guess it is true after all. We have a fantastic Farmers Market located in the park near our apartment. At this time of year the displays of colours and produce is just spectacular. I have been wanting to do a post about it for several weeks. But regular as clockwork, every Saturday morning when we were heading off to the market, it would cloud over and start to rain. I kept thinking, 'Oh well I'll do it next week when the weather is better.' Now fall is almost over and we still haven't had a nice sunny Saturday so in desperation I snapped off a couple of shots in spite of the rain. I then went about getting my shopping but it was very wet and chilly so it was a brief visit. When I got home I started unpacking my purchases. When I got to the fingerling potatoes I smiled and showed my husband the slightly suggestive potatoe that I had inadvertently picked up. Then I started unpacking the decorative gourds and mini pumpkins that I had got to decorate for the season. OH MY!!! Well that is more than 'slightly suggestive.' I could ask - what was I thinking? But I think the answer to that question is self-explanatory! I wonder if I should get him some penicillin??!! I have been very remiss in my blogging lately and also, worse still, I have been neglecting to visit my blog friends. And as usual, it is work getting in the way of my blogging! So as I have been all work and no play lately, I have to post about work. We have been celebrating the ten year anniversary of the Nature Museum, the current home of the Chicago Academy of Sciences. In order to commemorate this anniversary we did ten days of free entry with a special event each day. One of the first events I was involved in organizing was a Bug Fest. 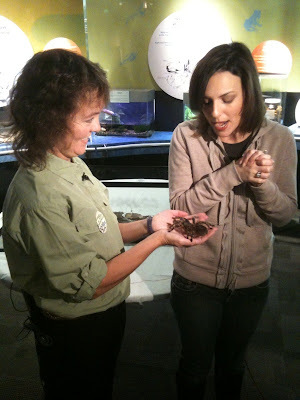 This was an entire day devoted to all things bug related. It was a very hectic and busy day that involved lots of planning but when it came down to it, it was a great success. We had a public cockroach feeding session where people could get to see what the roaches get served for lunch! His recipes were a great success and you probably won't believe me but they were really tasty! He prepared Chocolate Chirp Cookies, they had crickets in them, Gumbo with meal worms, Tacos with ant larvae and mole cricket Tempura. We also displayed a small number of the Academy's extensive historical collections and some of our collections staff were convinced to come out of hiding and share some of the secrets of successfully preserving invertebrate specimens. We also had face painting and there were lots of folks wandering around with all kinds of creepy crawlies painted on their faces! One event which is always hugely popular is our 'first flight' butterfly release. This is when we release all the newly emerged butterflies that have just come out of their chrysalids, into our butterfly haven. The children are always captivated by this.